We are Salmon Junkies is a mind-blowing, 60-minute ride into a world of Steffen Juhl, one of salmon angling’s most compelling characters and a bona fide salmon junkie. The film follows Juhl’s seasonal “lifecycle” and in so doing offers a fascinating look into an international subculture united in pursuit, protection and celebration of the iconic Atlantic salmon. 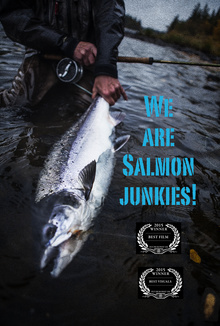 For anglers of all stripes — for anyone who cares about the future of Earth’s last wilderness places and their free-roaming inhabitants — for anyone enthralled with the magic of the natural world — We are Salmon Junkies is a must-see film. 17 Comments. Add your thoughts.